Yes, Unlimited Access to BlackBerry Messenger (BBM), Facebook, Twitter and Instant Messenger (IM) for only 299 Pesos in a span of 30 days! This is what Globe BlackBerry Social is all about. Fresh from Globe, Globe BlackBerry Social offers BlackBerry users unlimited access to social networking like Facebook, Twitter and instant messaging sites, BBM, IM. Here's how to avail and use Globe BlackBerry Social, Just Text BB SOCIAL ON to 8888 to Subscribe. Bianca Gonzalez, TV Host and Liz Uy, Fashion Icon can attest to how the service enables them to do more despite their busy schedules: guestings and hosting stints for Bianca, and pictorials and fashion shoots for Liz. Bianca Gonzales and Liz Uy manage to squeeze in some time with people who matter most through Globe BlackBerry Social and the exciting services bundled with the offer. Liz Uy keep her 160,000 loyal Twitter followers in the loop, ensuring that all of them are apprised of her latest fashion finds, events she is attending, and clients she is working with through Globe BlackBerry Social Plan. Using her Globe BlackBerry Social plan, Bianca Gonzales keeps friends and supporters close to her regardless of where she is or what she is doing. Globe BlackBerry Social gives users full and unlimited access to BBM, Facebook, Twitter and Instant Messaging anytime and anywhere at an affordable cost only P299 for 30 days. Text BB SOCIAL ON to 8888 to subscribe now. 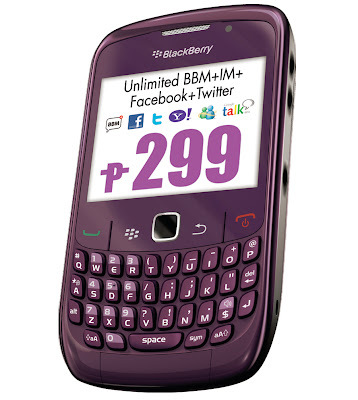 0 comments: on "Globe BlackBerry Social unlimited BBM FB Twitter IM P299 only for 30 days"